This week was a tad frustrating. We had received a note from our honey bee supplier that bees would ship sometime the week of April 27. I kept all of my plans soft expect to dash off an hive our packages of new bees. The calls never came and when fellow Bee Team member Lorraine called our supplier, we were informed that the bees were coming next week. AAAAARGH! ME WANT TO PLAY WITH BEES NOW! But birds are always there for me when bees are not. Friday's bird banding added in some spring migrant excitement. While I've been reading about friends in the southern US seeing warblers, I've been practically salivating. Well, we got in a female yellow-rumped warbler in the nets on Friday at Carpenter Nature Center, the spring migration flood gates are about to open! As we were banding, Al, who is in charge of volunteers enthusiastically complimented my hair. I just got colored, so initially I figured the compliment was natural, but the tone had a sense of urgency. Sure enough, he asked if I would be willing to help out with Carpenter's beehives. I was simultaneously incredibly honored and nervous. It's a tough economy right now and like many places that rely on grants and donations, Carpenter has had to cut back on staff and ask volunteers to help where we can. Staff at Carpenter take care of the education animals, maintain the property, give programs, organize events, the list goes on and on. Al is the one who normally takes care of the bees. Way before I ever had bees or even took a beekeeping class, he let me follow him out to the Carpenter hives, just to get a feel for it. 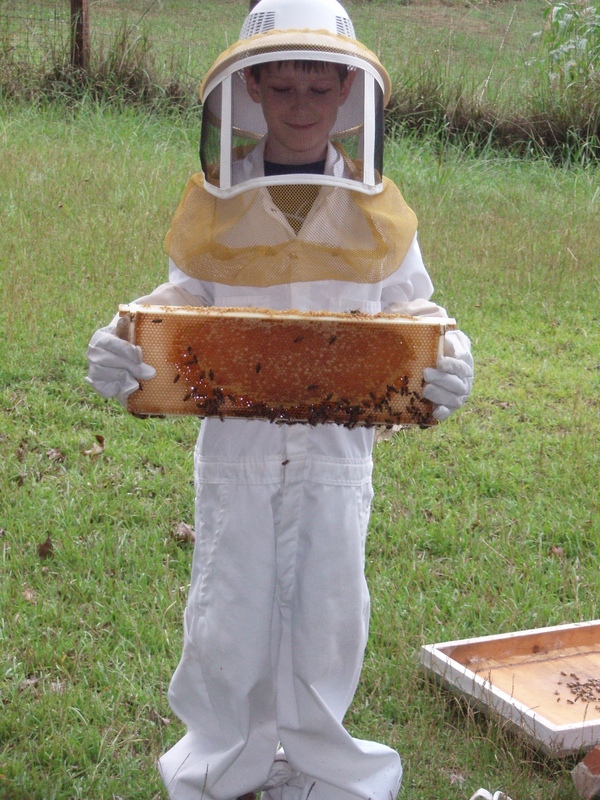 He's been beekeeping since he was a kid and knows much more than I do. The fact that he asked if I would check on his hives was a huge honor. It's one thing for me to make a mistake with our own hives, but to make a mistake or do things differently from the way Al would run his hives made me nervous. But I wanted to help because Carpenter has an apple orchard and they need their bees. I suited up and started the smoker and headed out. Oh! It was so awesome to be back at a hive and actively work it. It was still fairly cool, and the girls were calm. Carpenter had a different bee suit than I'm used too and I had some concerns that there might be a breach. We use what I call the space man suit, the hood is attached to the suit and when it's all zipped up, it's hard for an angry worker to get through. Carpenter has the suit, but the hood is a pith helmet with a net over it. I could see potential breaches all around my neck as I worked. But the bees were calm, I took my time and forged ahead. I looked all through the hive for the queen or even signs of her. I found some capped brood and a bit of larvae, but no queen and no fresh eggs. Al told me to do a reversal to make sure his queen was in the top box. Bees work from the top down. So, if your queen is in the bottom box of your hive set up, then you just move the box she's in to the top. The youngest larvae was on the bottom, so I hoped she was there and put the bottom box on top hoped I didn't crush anyone. I also made her a container of bee nectar and a pollen patty to feed the girls. They still had some of their winter stores left (above is a worker feeding inside a cell. I think I spent about an hour with this hive. Just checking the frames, going super slow to make sure I didn't crush anyone and also savoring time with the bees. I haven't actively worked a hive since October--six months ago. They were so calm, so furry. The girls got a little irritated with the reversal, but nothing too bad. It was fun to go with the groove of the hive, the contented buzzing was very soothing. The other hive was much easier to work with and totally friendly. I found fresh eggs and larvae right at the top box in the hive. I decided not to dig much deeper--the eggs meant the queen was right at the top, why disturb her work and risk crushing her? This hive looked to have mostly Italian looking bees--with a beautiful gold color, but I periodically found a black bee (a carniolan). Wonder what kind of drones the queen mated with in this hive? I love to watch bees feed on sugar that I've made. It does seem for just a moment, that they are little furry pets, coming up to gently lap the nectar that you have so carefully preparedfor them. I told Al about not finding the queen in the first hive and reversing it. He said that he had actually reversed that one a week ago--doh! Ah well, best laid plans. Who knows where the queen in that hive is? He thanked me and said that he'd appreciate any help I could volunteer this summer. I'm happy to help, Carpenter is my favorite nature center in the Twin Cities and if any of my skills can be of use, I'm happy to offer. Plus, it will be a chance to learn from a very experience beekeeper. Al managed to get two hives to survive the winter, I still need to master that. Well, I hope our bees arrive before I go to Kazakhstan this weekend. I'd hate to miss the hiving.